For new or old gates, up to 6 ft. width and any height. Prevents and eliminates gate sagging. Powder coated steel, robotics welded. Easy and quick to install. Includes 4 gate frames (2 hinged) and weather resistant screws. Decorative spear design and with decorative material. Ideal for gates, sheds and garages. Instantly adds curb appeal to your home. 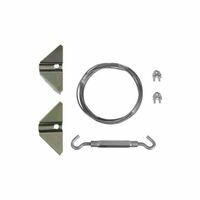 Kit includes: 4 dummy hinges and 2 pulls. 16" dummy strap length. Ideal for repairing an old gate or building a new gate. Equipped with all necessary parts and installation hardware. Can be assembled on-site. Adjustable frame and truss system for quick installation with professional results for almost any application. All steel fade resistant frame prevents sagging and dragging. Create a double drive gate using 2 adjust a gates systems. 1-1/2'' square frame and hardware. Adjustable diagonal truss cable keeps gate straight. Fits 4', 5' and 6' high fences.